Me too. Number of licenses plus the trend -- e.g. below average, average, above average -- are the most helpful things to hear about, along with any better than average ($100+) sales. Think I'll make this my policy (no gross $) from now on. +1 I think. Although it was interesting to see how the averages compared with mine, I never quoted my own, and by now of course we all know how they compare. So just a note on how averages are holding up is enough, I think. I probably used to withhold figures out of embarrassment really. No need to be embarrassed with a number with no $ sign in front. Perhaps whoever starts the threads in future can just add- "just the numbers" or some such phrase. We could always have a parallel "How embarrassing was your month?" thread. Good idea therefore i am going with .. I disagree with this. I find it informative to see how much somebody has earned in gross figures and then see how many images they have and what they are like.It also shows an approximate RPI if you add up the totals. With that information you can compare you own results with others and attempt some sort of conclusions. Reporting above or below average is essentially meaningless because every month can only be one of three things and each individual will assess it differently. I am also rather embarrassed at times when reporting my gross sales but that is the reality of the situation we are in. If I conclude that others are doing better (and worse) I get an insight into how I might do better. Being a stats nerd...I have been tracking a sampling, I am happy to share those metrics with anyone....it helps me know what I need to do. Exactly. I've pursued this before, but, as you suggest, Alamy have made it clear that they do not want a private section of the forum for members to discuss things like this. A shame. Totally a shame. I guess they see more cons than pros to having one. anything to stop us from organization a private thread somewhere else? I am going to join the more info is more group. Above or below average doesn't mean much to me. I usually skip posts that give no specifics. I don't see the harm in being specific. I think alamy like to post gross sales milestones for some people. Why not us? I can't imagine what the cons could be. But I also surmise that they don't see revealing our sales prices as a problem. After all, if a small buyer said to Alamy, "Hey, I'm paying X but s/he's paying Y" Alamy would likely say, "Yeah, but they're buying 100/whatever images per month". I'm with Reimar on this - the average for an individual means next to nothing to me. I'm interested in net earnings (my averages are definitely on the low side). There is already a FB group. Not sure it's kosher to discuss it, though. I can't see any point in pretending that things are better than they are or trying to hide the true situation. Like: it makes them feel good. Makes others miserable. Gets you free beer in the pub. Gets you free whatever at home. Cheaper than going to a movie about a photographer. the information that Alamy provides or that contributors post on the form would have very little effect on the daily business of Alamy, in my opinion. P.S. June was just OK, but July is looking up and this year the license fees have improved a bit. The main purpose of the forum is that it helps Alamy. It means that newbies are helped, and questions get answered. It takes pressure off Contributor Relations or whatever it is called now. Also, a lot of potential conspiracy theories get challenged and laid to out in the fresh air rather than festering away and multiplying in the darkness! Whether helping newbies and answering questions helps us as individuals depends on your opinion, but I am grateful to receive help and so like to try and reciprocate. Personally I have had enough of private forums - I much prefer this one with Alamy's usually light-touch oversight. Back to the topic. I'd like it personally if everybody posted 'number of sales + gross'. I find it useful to know what figures we are working with and what can be achieved by those better/more successful than me. Rather than us all putting up our numbers individually with subjective comments I’d like to see alamy publish some data. Anonymised analysis ie count of contributors who sold 0-25, 26-50, 50+ images for gross revenue <100, <200, <300 etc. Per month and per year categories. Plus some trending going back 1year, 5 years, 10 years. That would be way more useful than us trying to draw conclusions from a subset of contributors who visit this forum, Have alamy ever been approached to do this? I've found the sales figures very useful. It helps me to identify which contributors are the most successful on Alamy and then try to learn from their portfolio and give additional weight to their forum postings. So, in the spirit of mutual co-operation, I tend to post my volume, gross, and net. I totally understand and appreciate any non-sharing. 9 sales, $244 gross, 2 small distros. I don't work out my monthly net, just what goes in the bank, so just stating distro numbers. BTW what's with the flock of reds on some innocuous posts?! June was just OK, but July is looking up and this year the license fees have improved a bit. Most of the improvement for me is coming from quite recent images - those who stop contributing due to falling sales may well be starting their own downward spiral. Flock of Reds - weren't they big in the 80s? UK weather. 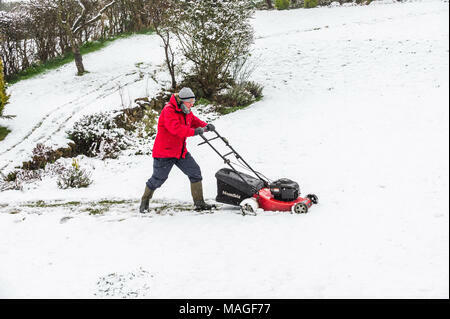 "Its Spring and the grass needs cutting". Used twice for $198 and again in my back garden. So there is no reason to travel far to get saleable images. It is interesting to see the exact figures, but those who do post them are publishing details of their income on to a public forum, i.e. accessable by anyone. Which means... anyone. And whilst I think the vast majority of contributors have nothing to hide from the taxman or benefits authorities or, or, or... it also doesn;t take to long to think of people for whom details of our individual income is none of their business. That has never been an issue for me, because I was a teacher, and all anyone had to do was look up the relevant government website and they'd know what I earned down to the last penny. That said I agree with Iain: sharing is optional. I think Funky means to refer to photographers running their own businesses- self-employed so not taxed at source. They appear to be making a comeback. Odd that this would be a touchy discussion for some.